Subbuteo Team Art - Page 4. 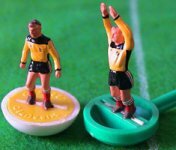 Miscellaneous Subbuteo items - Everything that didn't fit anywhere else. OPS - a Finnish team. The trim are "Hummel" lines. This was a Scandinavian brand of the early 1980s. France - Goalkeeper only. Mundial jersey as worn in 1982. The detail doesn't show clearly on this one, but the Adidas lines are in blue and red, and the French badge is also two colour. Nottingham Forest. Adidas kit which is spot on to the photo shown. Carlo's final selection is this beautiful Inter Milan. I've broken my size rule for this one. There is so much small detail on the kit, that I couldn't do it justice at the usual size. The artist's name here is Mancini. As a change from the usual footballers, here is the first of Ric's painted cricket teams. This is England, from the 1999 World Cup. 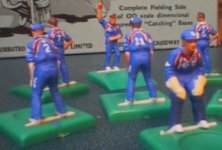 Makes the original Subbuteo cricket sets seem rather bland doesn't it ? ?